China is slowing down. Forget all the reported statistics and those that have recently been discontinued—like Guangdong’s monthly purchasing managers’ index—money and credit tell the tale. Indeed, there is a strong link between the broad money growth in China and nominal GDP growth. For example, during the 2003-2017 period, the money supply (M2) grew at an average annual rate of 14.92% and nominal GDP grew at a 14.67% annual rate. 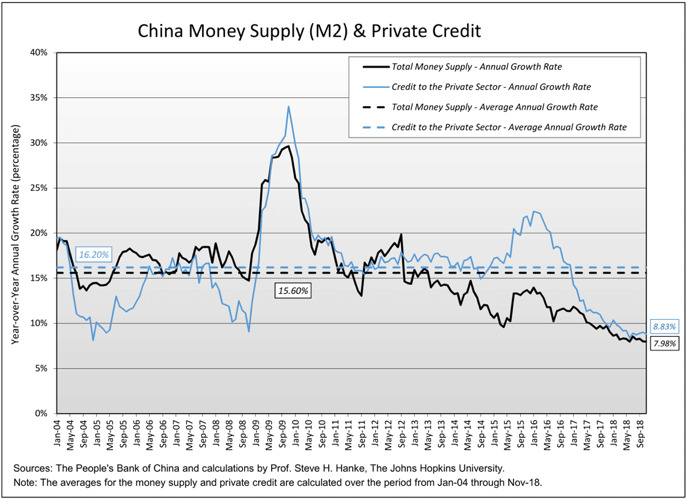 The chart below indicates that both money and credit growth rates in China have declined rapidly over the past two years and are well below their trend rates of growth. The money supply (M2) rate of growth is only about 8% yr./yr. ; whereas, its trend rate is nearly double that. So, China’s economic slowdown is baked in the cake. In addition to that, deepening international trade tensions and the heightened degree of nervousness among the Chinese public set the stage earlier this week for President Xi’s address to some 3,000 officials and guests in the Great Hall. The occasion for Xi’s much-anticipated address was the 40th anniversary of China’s opening towards a more capitalist, market-oriented economic system—an opening that was presided over by the late Deng Xiaoping. The ensuing doses of capitalism worked their magic and have fueled the world’s greatest economic leap forward on record. China’s leap forward has been documented and analyzed by my good friend and the late Nobel Laureate Ronald Coase and his co-author Ning Wang in How China Became Capitalist (Palgrage Macmillan, 2012). Of note is the fact that Coase celebrated his 101st birthday in 2012, the year in which this brilliant, and Coase’s last, book was published.